There are so many impressive places to visit in the Lakes. If you're a fan of the historic, you'll find so many delightful churches, castles, houses and gardens. Many of them have other wonderful exhibitions, like the motor museum at Holker Hall, or the owl centre at Muncaster. Below, we've listed some of our favorites. 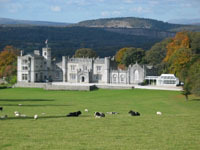 We start the list with the Lakeland "Hallmark Attractions", a group of six impressive places - Brantwood at Coniston (one-time home of John Ruskin), Leighton Hall near Carnforth, Holker Hall at Cork-in-Cartmel, Levens Hall near Kendal, Muncaster Castle near Ravenglass, and Sizergh Castle near Kendal. And while Carnforth may not be exactly in the Lake District, it's certainly near enough for a day trip from any part of the southern Lakes. Each of Lakeland's Hallmark Attractions is an interesting and historic place in its own right, but they all have added attractions - superb gardens and lake views at Brantwood, a superb birds of prey display at Leighton, the historic motor museum at Holker, and so on. Below, we give brief details of each of them, and further contact information. All of them are superb and we highly recommend a visit. If you have children, the gardens and owl centre at Muncaster are especially good, and you could combine your visit with a trip on the Ravenglass and Eskdale railway. But there really is something for all the family at every one of these venues, and you're guaranteed a great time whichever you go to see: the owners have worked really hard to develop their properties into the highest quality attractions for visitors - and without doubt they have succeeded admirably. And on the list below we have other superb places which we consider well worth a visit. Various events take place throughout the year - so check each venue's website for the latest details and opening times (these may change, and it's disappointing to have a wasted journey). The Castle has been a cherished family home since 1208. Visitors are guided around its many treasures with a delightful audio tour. The extensive woodland gardens, famed for their colourful rhododendrons and stunning views, are home to over 180 birds of prey. Throughout the season you are invited to "Meet the Birds", hear about the conservation work of the World Owl Trust, and watch the birds fly free. For full opening and event details, click here. Brantwood is the most beautifully situated house in the Lake District, enjoying the finest lake and mountain views in England. From 1872 until 1900 it was the home of the scholar John Ruskin and became an intellectual powerhouse and one of the greatest literary and artistic centres in Europe. As well as being a constant memorial to his life and work, with continual displays of his drawings, watercolours and personal memorabilia, Brantwood is also a venue for a wide range of exhibitions by a variety of local artists and craftsmen. Its grounds offer glorious woodland walks after which visitors can enjoy refreshments in Jumping Jenny's Restaurant and tea rooms. Open all year. Mid-March to mid-November, daily 11.00 am to 5.30 pm. Winter Season, Wednesday to Sunday, 11.00 am to 4.00 pm. Breathtaking views of the Lakeland hills greet visitors to this beautiful family home, which offers a special blend of attractions: lively tours, peaceful gardens, woodland walks, and charming tea rooms. Home to the Gillow Reynolds, descendants of the famous furniture makers, Leighton Hall has many unusual Gillow pieces as well as fine objets d'art and paintings. Outside there are lovely woodland walks and a traditional 19th Century garden. The Aviary Garden is home to Leighton's unique collection of birds of prey which each afternoon, weather permitting, provide a magnificent display. Open daily from May to September, 2.00 pm to 5.00 pm (August only 11.00 am to 5.00 pm). Closed on Saturdays and Mondays, except Bank Holiday Mondays. Since the Middle Ages the castle has been home to the Strickland family. The impressive 14th Century pele tower was greatly enlarged in Tudor times and contains some of the finest Elizabethan wood carvings in the country. The surrounding informal landscaped gardens include a rich variety of plants including part of the national collection of hardy ferns. An impressive feature is the large limestone rock garden with alpines and dwarf conifers along with Acers which provide vivid Autumn colour. There are pleasant walks across the estate farmland with views to the sea and the Lakeland mountains. Sizergh Castle is open from 1 April to 29 October, Sunday to Thursday, 1.30 pm to 5.30 pm. The Gardens are open from 12.30 pm. The Shop is open at the same time as the gardens, also Tuesdays, Thursdays and Sundays 12.30 pm to 4.30 pm from 1 November to 21 December. There's good access for less-able visitors and facilities for those with impaired vision. Situated just five minutes from junction 36 of the M6, Levens Hall is a magnificent Elizabethan mansion built around a 13th Century pele tower. The family home of the Bagots, it contains a collection of Jacobean furniture, fine paintings, the earliest English patchwork and many other interesting historical objects. The world famous gardens were laid out in 1694 and feature topiary, beech hedges and colourful seasonal bedding that combine to create a stunning visual impact. Plants can be purchased and there is a gift shop offering a wide choice. Visitors can enjoy home-made light lunches or teas and may even like to try the special Levens beer - Morocco Ale - brewed from a secret recipe! On House open days the working steam collection runs from 2.00 pm to 5.00 pm. Levens Hall is open from 1st April to 15th October, Sunday to Thursday, the Gardens and Tearoom from 10.00 am to 5.00 pm and the House from 12 noon to 5.00 pm. 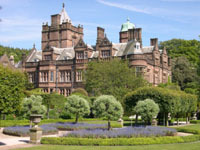 Located in the gentle countryside of the South Lakes, Holker Hall offers a fabulous range of experiences. There's 400 years of fascinating history in the hall, a 125 acre Deer Park, and the magnificent gardens. Motoring enthusiasts, whatever their age, will be enthralled by the unique collection of vintage and classic cars. And nature lovers will thrill to the sight of live hunting birds of prey at close quarters and in flight. You'll find a full range of facilities including a gift shop, cafe, adventure playground for the youngsters and an idyllic picnic area. This is a great place for all the family. There's now also a fantastic food hall, where you can buy superb local and organic produce. Holker is open every day from 1st April to 30th October, 10.00 am to 6.00 pm (or dusk if earlier). Last admission 4.30 pm. This is a truly magnificent place, one of the most impressive churches in the North of England. It was a priory attached to the wealthy Furness Abbey, and it survived the reformation in fine style. Now it's right in the centre of the village, and very impressive it is too, with superb Norman (Romanesque) foundations and arches, and Early English and Perpendicular additions. Highly recommended, both for the village itself (home of the famous sticky toffee pudding shop), the priory, and the setting of the whole place, which must be one of the loveliest villages in the area. Also recommended nearby - L'enclume ( see the accommodation page) and Holker Hall (see above).